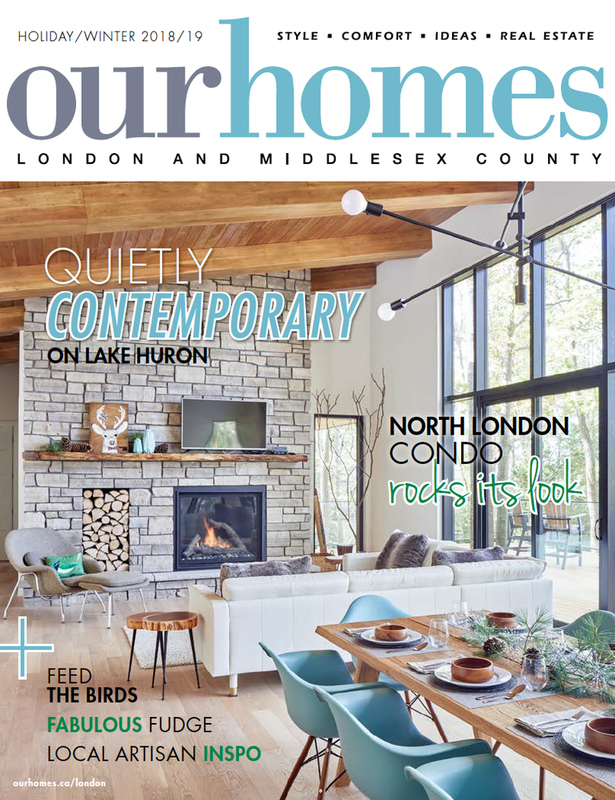 A version of this article originally appeared in the Holiday/Winter 2018/19 issue of OUR HOMES London and Middlesex County, p.14. Find local businesses in our London directory. 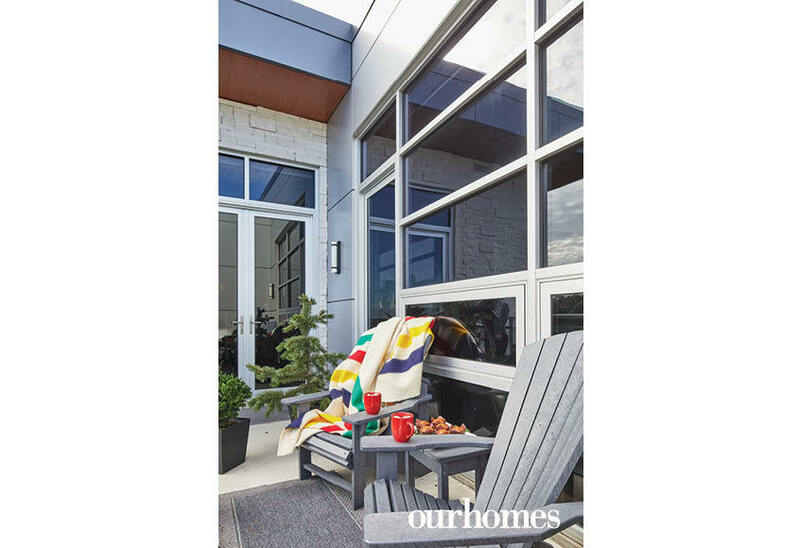 With a background in architecture, the opportunity to design and customize a completely unique space is what attracted these homeowners to their condominium in the sky in London, Ontario. 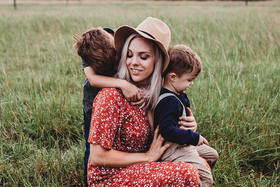 The owners worked with local artisans and tradespeople to bring their vision to life. This 1,200 sq. ft. one-bedroom unit makes an incredible impression right from the front door, where the owners separated the entrance vestibule from the rest of the unit with a hot-rolled metal and glass door created by Red Iron Design. 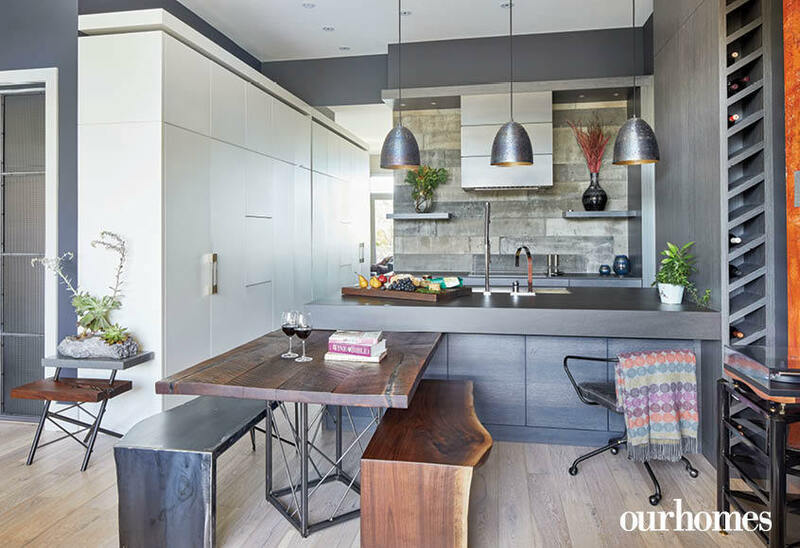 The industrial-inspired aesthetic continues in the open-concept kitchen and great room. Wanting to maximize their living space without sacrificing their love of entertaining, the homeowner worked with Roth Design Inc. on an ingenious dining solution – a pivoting walnut slab with triple functionality: it can serve tucked into the island as a breakfast bar, be pivoted 90 degrees to make a casual L-shape table or be pulled away from the island entirely to serve as a standalone table for 10. Two custom benches, one in live-edge walnut and the other in hot rolled metal (Roth Design), offer seating that is just as adaptable. Side tables in the living room become supports for the walnut table when in use. 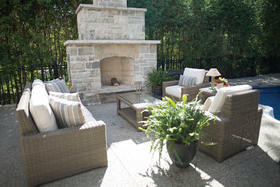 "A lot of thought and craftsmanship went into this design,” the homeowner notes. The kitchen is as visually stunning as it is functional. A large white pantry hides the Gaggenau refrigerator, a wine and coffee bar and plenty of storage space. Two floating shelves frame the rolled-metal oven hood (Red Iron Design) and provide a clever hiding spot for the kitchen’s electrical outlets. Cabinetry consists of soft-close pullout drawers throughout and, with the exception of the cooktop, all the appliances are hidden. 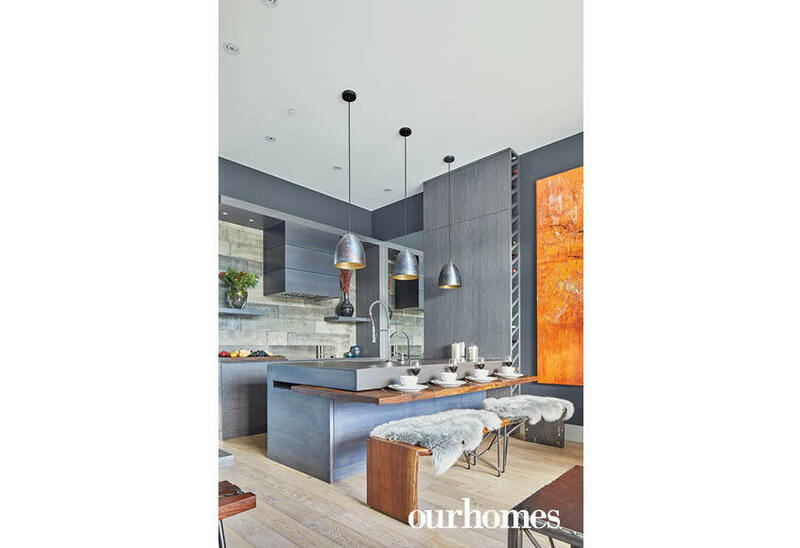 The backsplash is made with textured concrete wall panels from Silex Element, while the countertops and island are finished with black Neolith sintered porcelain, a virtually indestructible material that resembles unpolished granite. 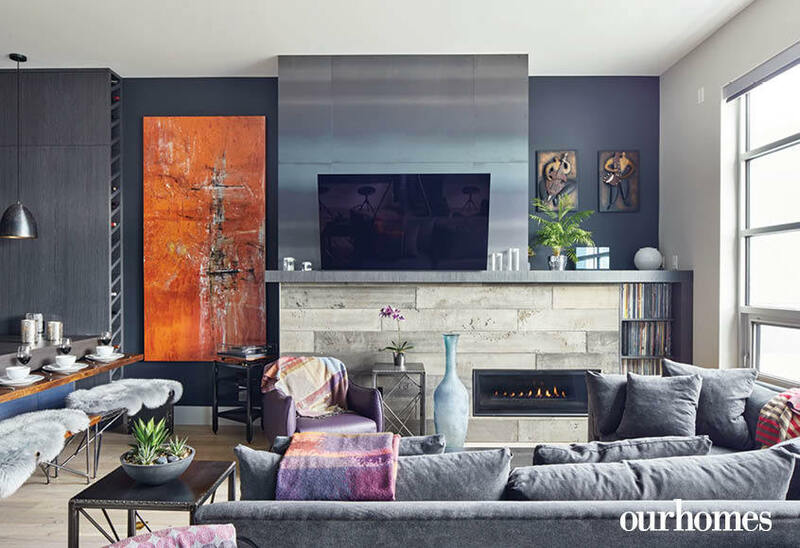 The mix of industrial materials and contemporary comfort continues in the living area where the fireplace surround incorporates concrete wall panels and hot rolled metal. Built-in shelving provides plenty of room for the homeowner’s collection of LPs. Floors throughout the unit are hand-scraped oak, an upgrade provided by the developer. 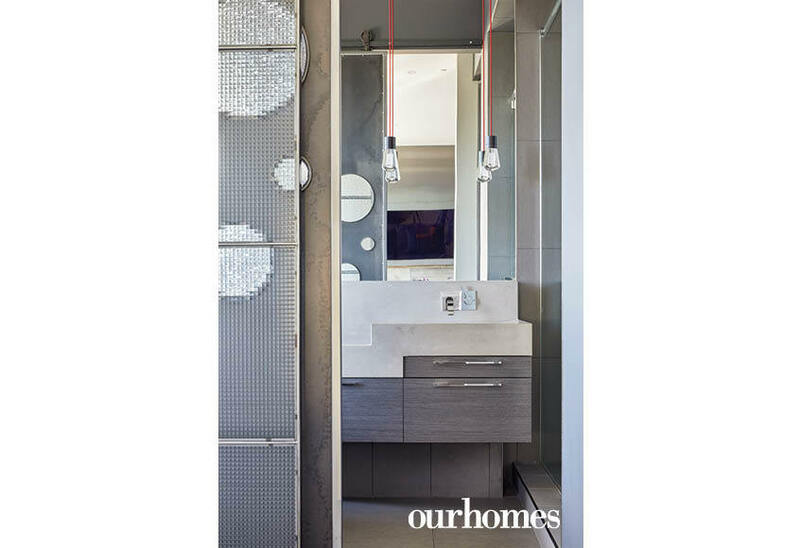 A pair of rolled metal doors with round glass inserts (Red Iron Design) add some visual fun and lead to a two-piece powder room and the master en suite. “At night you can see the lighting come through,” the homeowner says. 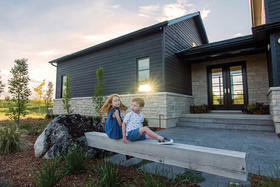 “It looks really cool.” Both feature poured concrete sinks by Exclusive Concrete. The large master bedroom uses a floating wall as a headboard to divide the sleeping space and a reading nook. Floating counters on one wall of the living room are among the keys to living large in a small condo. 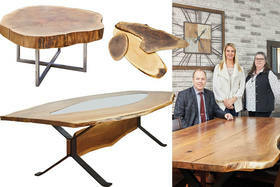 These multipurpose surfaces work as well for desk work as seating the overflow at a dinner party. 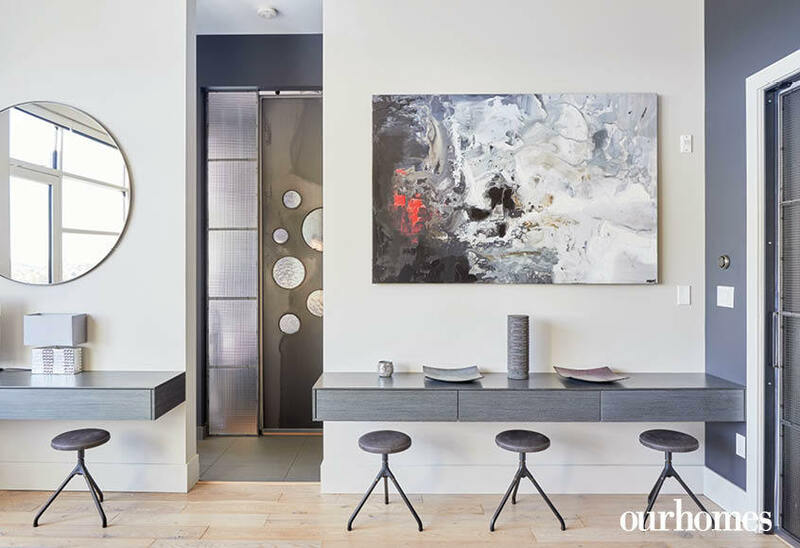 The circular mirror bounces light into this corner of the room while a custom door with circular insets offers an artistic separation between the living and bedroom space. A custom entrance vestibule built inside the unit helps to minimize hallway noise and offers a place to tuck away the laundry and utility area. A floating desk doubles as a home office or extra surface area when entertaining. The living room area uses modular sofas that become two twin beds when guests visit. Side tables become supports for the dining table. A low, linear fireplace is clad in textured concrete panelling. Large, bright art has high impact. A slab of walnut rotates and slides under the counter, creating a breakfast bar option and leaving the living room floor space open. The table supports become side tables in the living room. Clever detailing like ceiling-height stacked wine storage makes use of every inch. A second mirrored wall in the kitchen adds to the sense of space. The ingenious dining table is a slab of walnut that swivels out from the island for an L-shape table, or can be pulled away as a standalone table. Side tables in the living room serve double duty as table supports when needed. A sleek wall of white, flat-panel cabinetry appears twice the size thanks to a floor-to-ceiling mirrored wall. A stylish sliding door opens to the master bathroom. A single-piece vanity sink is lit with simple bulbs hanging from red cords. Without a wall dividing the master bath from the bedroom, the room seems more spacious while the soaker tub eases the transition between bathroom and bedroom. 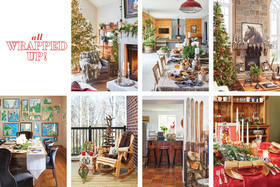 Red cords on the hanging lights bring colour to the otherwise grey and white space. Doors throughout the unit have been customized with circular details. The owner created a half wall behind the bed to divide the sleeping portion of the room from a sitting area that opens to the terrace. 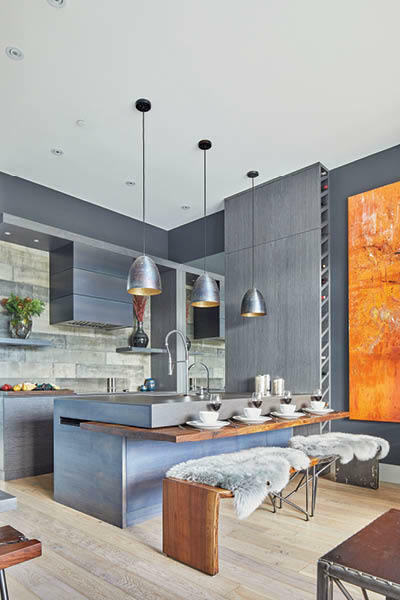 Faux fur pillows and metal and metallic accents give the space personality. The living room and master bedroom both access a large outdoor terrace with premium view, sun-drenched year-round thanks to southern exposure. 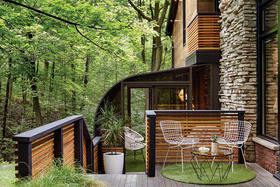 A reno embracing past styles pulses with new life.